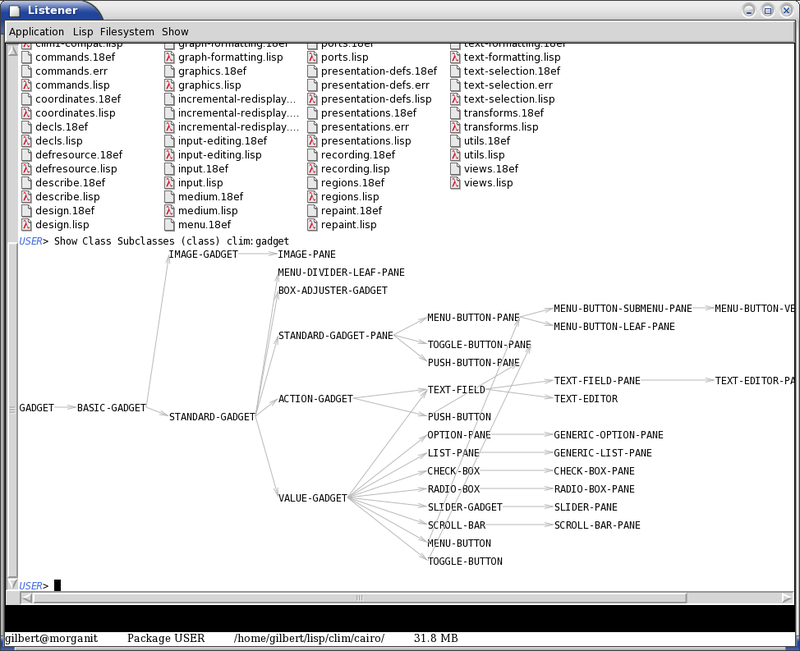 The beginnings of a clim cairo backend. real ellipses seem to result to not the quite correct shape. Mostly SBCL integration work thanks to the fruitful collaboration with Paolo Martini on #lisp. A null.so is automatically created for linking calling 'pkg-config cairo --libs' for more rubustness. More work has been done to sort out CLX/Xlib synchronization issues. Invoke what ever magic necessary to make clim-cairo.asd or clim-cairo.system been seen by your REQUIRE. Invoke your favorite McCLIM application. ;; Older tar ball of the stuff. ;; Old tar ball of the stuff. ;; Current tar ball of the stuff. ;; More p0rn from http://segfaulted.com/~xerox/mcclim-cairo/, courtesy of Paolo Martini.